Cremation, otherwise known as a Final Disposition, simply means that instead of being buried, one is cremated. And if a cremation is ultimately decided upaon, familes can still have a viewing and a funeral, and then have the remains cremated. At Brown Colonial Mortuary, we offer a rental casket as well as a large selection of alternative containers -other than caskets- that are suitable for these types of funeral services. Upon cremation, the family needs to decide how they would like to store the remains. 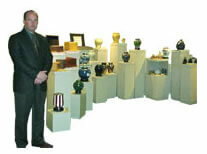 We have many urns from which to choose or you can look at www.cremation-options.com for other options.